Joint personnel netted 118 vehicles in an operation held on several road spots in East Jakarta. This operation targeted illegal parking vehicles and public minivan that stopped illegally on the roadside.
" We intensify illegal parking operation and also unravel the congestion"
East Jakarta Transportation Sub-dept. 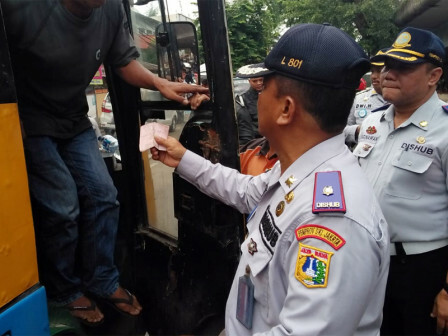 (Sudinhub)'s Monitoring and Controlling Section Head, Slamet Dahlan conveyed, traffic operation was run because there were still many road users who violate the rules such as illegal parking and stop illegally thus it causes congestion. "Jakarta Government intensifies its monitoring to handle traffic congestion. So, we intensify illegal parking operation and also unravel the congestion," he explained, Tuesday (12/4). His side held operations on Jalan Otista Raya, Jalan Raya Matraman, Jalan Jatinegara Timur, Jalan Bekasi Timur and Jalan DI Panjaitan. From this operation, 10 vehicles were towed, 8 vehicles were grounded and stopped for operation in two weeks, 76 vehicles were ticketed by police officers, and 24 vehicles were ticketed by Sudinhub personnel. "Some vehicles were grounded because drivers doesn't have driving documents and vehicles are in unroadworthy condition," he said.